Managing type one diabetes while participating in endurance sports requires the ability to adapt while on the move, balancing insulin, nutrition, and pacing strategies. I usually don’t go into details about insulin dosing or even blood glucose levels. I will say that even when I run long distances, I give my full basal dose of long acting Levemir insulin. And if breakfast is at least two hours before the race start, I also administer a normal bolus of fast acting Humalog insulin. My preferred breakfast is toast, eggs, a cup of coffee, and juice or fruit. Additionally, I might eat a snack on the way to a race venue, like a Cliff bar and sip on an electrolyte drink or water. During the run, I generally stick with liquid calories. I have tried different products over the years with similar success. Luckily, my stomach tolerates a variety of options. I have thrived on simple things like maltodextrin and Nuun tablets, Pacific Health Endurox, and recently, Hammer Perpetuem. I also take Saltstick salt tablets as conditions and effort dictate. I carry gels to sporadically bump up the calorie count and sometimes enjoy the fat and protein of a Justin’s almond butter packet. My plan was based on maintaining a fairly easy level of effort, moving consistently throughout the day. There are days when everything goes according to plans, but today the key to completing this 50 mile course with anywhere from 10 to 14 thousand feet of climbing was adaptation. I was momentarily brought to a stop from a slight miscalculation of insulin potency. About 45 minutes before the start, my blood sugar was high. It presented a dilemma because although I never like to be out of range, even the smallest amount of fast acting insulin could drop me too low while running. I chose to give some insulin and run the first few hours extra conservatively in terms of pace to minimize the exercise effect on insulin potency. It seemed to work, but I finally crashed while approaching the halfway point. The mile 23 aid station could not come soon enough. I struggled through a flat section instead of cruising. Eventually, I reached aid a mile or two later than expected. I reluctantly sat down and took the time I needed to ingest enough sugar to stave off the low. Course tip: mile 23 and 43 aid stations are further out than they are listed. I lost some time there, but I was able to stabilize and resume my slow yet steady pace for the remainder of the race. Many thanks to aid station workers for encouraging me to wait until I felt better before proceeding. Immediately ahead of this aid station was the biggest climb of the day, two thousand feet up the mountain to Sandstone Peak. The course description on The Ray Miller Trail Races site accurately depicts a scenic treat that is surprisingly remote for the Southern California Coast. It was well marked, though I managed to take a slight detour once before quickly realizing my mistake and going back on course. 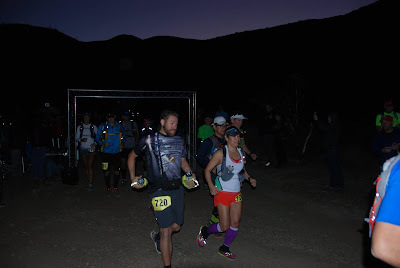 This is a Fall Ultramarathon and I typically finish in the nighttime. Tonight, the sky mystified the scene at the finish. 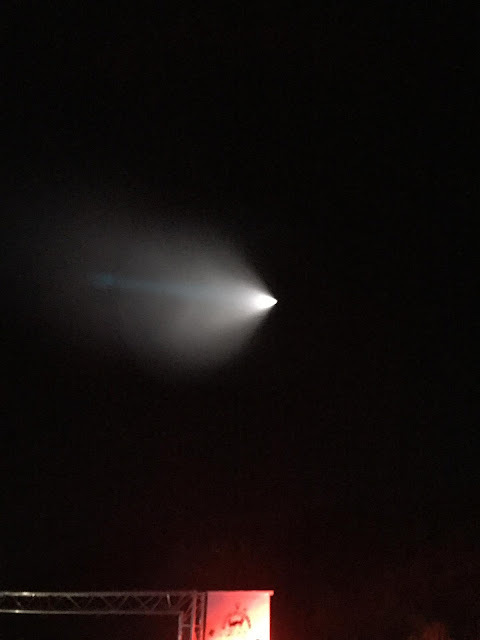 A surprise missile test from nearby offshore puzzled many spectators.